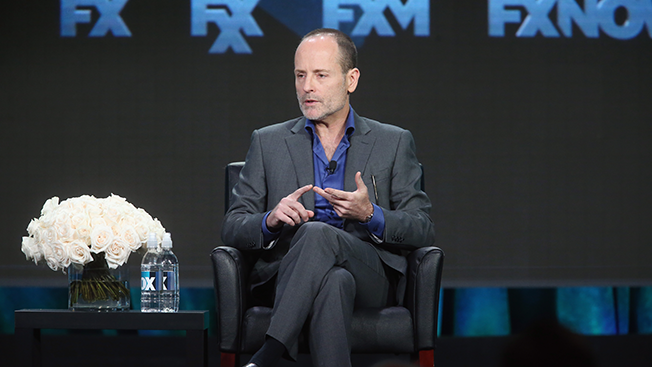 One year after coining the phrase "peak TV" to describe the overwhelming amount of TV available on broadcast, cable and streaming platforms, FX Networks and FX Productions CEO John Landgraf said that the glut will get even worse before it gets better. Last year, 419 scripted series aired on linear and digital platforms, which is almost double the 216 scripted series that aired five years earlier, according to FX's research team. That number could increase to as many as 450 this year, said Landgraf, while 2017's output could reach a whopping 500 scripted shows. That's in addition to the 750-some unscripted shows that also air. The television business is "probably unsustainable" for more than 500 scripted series, Landgraf said at the Television Critics Association's summer press tour in L.A. He predicted that the number of scripted series will finally start to drop off by 2019 at the latest (a revision from his earlier assessment that it would start to happen by this year or next). 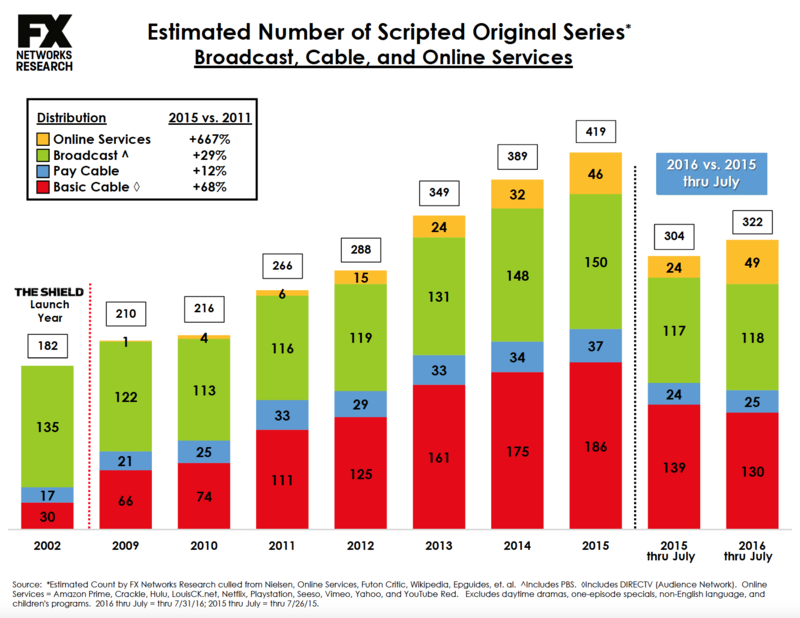 Last year, at this point through July, 304 scripted series had aired on TV's various platforms. That number has jumped to 322 this year, an increase of 6 percent. 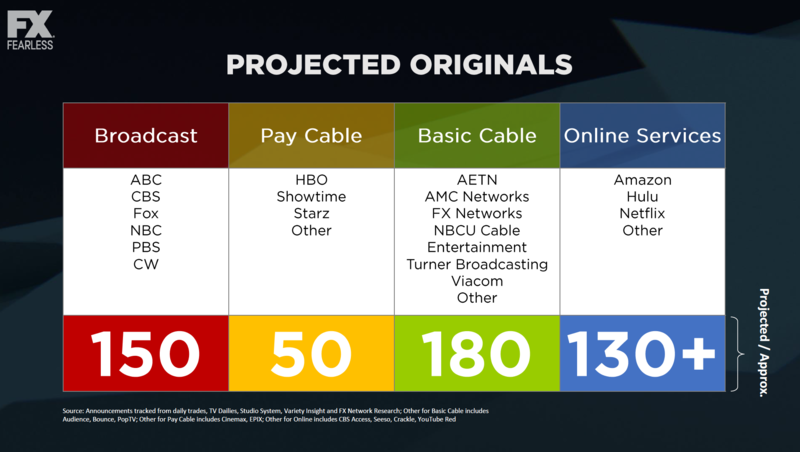 While output from the broadcast networks and premium cable is flat, and basic cable is down nine shows, online programming, which includes Netflix, Hulu, Amazon and other streaming services, has doubled its output, from 24 to 49 shows. Counting international series, Landgraf said FX's research team projects there will be 430-450 scripted series released this year. More than 510 shows have already been announced going forward, which could push 2017's total to "approach or slightly exceed 500." The volume of shows makes it more challenging than ever for networks to monetize their shows and reach overwhelmed viewers, said Landgraf. Because of Peak TV, "we've lost much of the coherent collective conversation," he said. Meanwhile, the average cost of making and marketing an hour of television today is $4-5 million, which has gone up 20 percent in recent years. FX's research team broke down the ratings of 350 shows on broadcast, basic cable and premium cable, and found that the shows in the top quintile averaged 10.5 million viewers, and the second quintile averaged 4.6 million. The bottom quintile averaged 380,000 viewers. "It's a feast or famine business," Landgraf said. "There have to be a whole lot of television shows being made that are losing money." Landgraf, who has previously blasted Netflix's "wonky" economics, noted that Netflix alone has announced 71 scripted shows (not including documentaries, kids series and foreign language series), which Landgraf said is more than the announced future output of HBO, Showtime, Starz and FX combined. FX's programming budget is one-third of HBO's and one-sixth of Netflix's. He questioned whether Netflix can give "personal attention" to all of those shows, given that at FX and FXX, "we're at or near the capacity of what we really can pay attention to," with 17 or 18 shows this year, said Landgraf. He thinks that 20 or 22 shows would be the maximum he could oversee at his networks. "Television shows are not like cars or operating systems, and they are not best made by engineers or coders," said Landgraf, who had talked to Adweek earlier this year about the importance of "human curation" in advance of Fox's upfront, which included FX and FXX. Despite Landgraf's comments about Netflix, he remains in business with the streaming service, as his company just sold SVOD rights to Netflix for The People v. O.J. Simpson: American Crime Story. Landgraf credited Netflix for agreeing to brand its acquired shows in a way that it wouldn't do previously, and said, "It was a phenomenal deal from a financial standpoint." Peak TV does have its upsides, said Landgraf, pointing to the "new and different perspectives" offered in upcoming FX comedies Atlanta (from Community's Donald Glover) and Better Things (from Louie's Pamela Adlon). After Variety's Mo Ryan wrote last fall about the lack of diversity among directors of color and gender, and noted that FX was bringing up the rear in that area, FX has made big improvements in diversifying its pool of directors. On the episodic current show cycle for 2016-17 season, 49 percent of directors are white males, 22 percent are white females, 22 percent are nonwhite males and 7 percent are nonwhite females. Landgraf was asked about the evolution of FXX, which launched in 2013. "We've got a lot of work to do, but I'm really happy with where it is now," he said of the network, nothing that "FX's brand is still fully taking shape" after two decades.